Two University of Maryland graduates have designed The Micro, a consumer-friendly, sub-$300 3D printer, and are quickly staging one of the most successful Kickstarter campaigns of all-time to produce it, hauling in $3.3 million with more than 10,000 backers. Now, with less than 24 hours to go in a 30-day campaign, this is the last chance to order from the first batch of The Micro 3D printers on Kickstarter, a Web-based funding platform for creative projects. 3D printing, also called additive manufacturing, is a process of making a three-dimensional solid object of virtually any shape from a computer-generated digital model. "A 3D printer is a magical box that creates things," said Michael Armani (B.S., mechanical engineering, 2005 and Ph.D., bioengineering, 2010), co-founder of M3D, the company he launched with David Jones (B.S., computer science, 2006). "It's that simple. There is nothing on your desk one second, and the next you have it." Weighing just two pounds, medium watermelon-sized and box-shaped, The Micro can be used to create anything from custom jewellery, cookie cutters, everyday objects around the house, and even real engineering and artistic prototypes, according to the company. Much like a paper printer, The Micro attaches to a computer, through which users download or create models using M3D's software, which company officials say is as interactive and enjoyable as playing a game. Once a model is selected, users hit print and the object is made. "Starting with a seamless design, we created the Micro by preserving the best features of existing printers and redesigning everything else," said Jones. "What's more, we kept the cost of The Micro low by ensuring that it's both space and power efficient, using as much power as a tablet would use. We are excited to be a part of the 3D printing revolution, and hope that The Micro will play its part in changing the way people build, innovate and create." New filament materials like Chameleon PLA. An ABS-based print bed allows you to print larger ABS parts. The Micro is powered by what the company collectively calls Micro Motion Technology™, a series of next generation innovations that together create precision at a fraction of the cost. 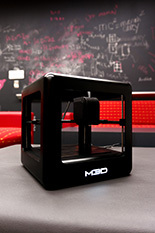 M3D plans to assemble its printers in the U.S. and is seeking manufacturing space in Montgomery County, Md. The company is based in Bethesda. Armani and Jones met at UMD in 2002 while auditing a biology class that neither of them needed to graduate. Their friendship has grown ever since. A serial entrepreneur, Armani won $5,000 in Mtech's UMD $75K Business Plan Competition in 2010 for CloudSolar, a company he launched to develop solar energy technologies. Additional UMD-affiliated M3D team members include: Danny Lee (B.S., 1989), Su Lee (economics, 2011), Aliaksandr Mamonau (electrical and computer engineering and computer science, expected fall 2015), and Syed Rahman (mechanical engineering, expected 2015). High-resolution screenshots, logos and headshots are available here. For more information, please visit The Micro’s website here and M3D’s website here.